KIVA Confections™ is a California based not-for-profit collective. They make only the highest quality medical edibles for patients, crafted from all natural ingredients and skillfully combined with cannabis. They lab-test every batch to ensure consistent THC potency. 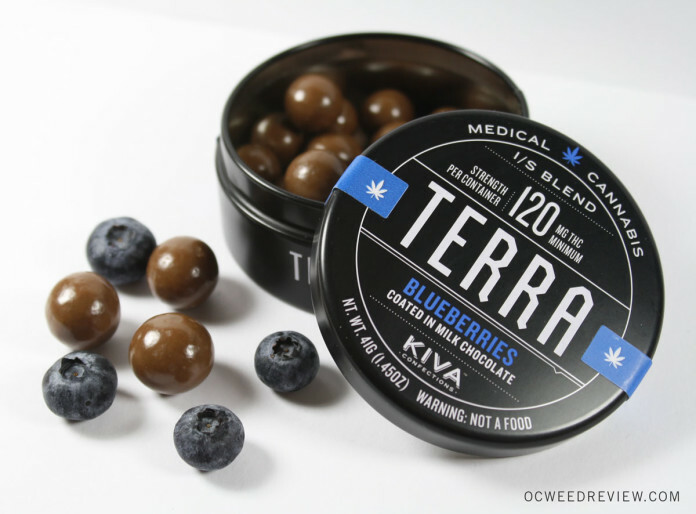 In this review, we’ll explore a recent addition to the Kiva line of products, their Blueberry-flavored Terra Bites. What's the Dose Like in Kiva Terra Bites? What’s the Dose Like in Kiva Terra Bites? Nugg has been huge fans of Kiva since day one, when they originally produced their tangerine chocolate bars. It comes as little surprise that we are just as pleased with their “Terra Bites” product line, which now features two distinct flavors, Blueberry & Espresso. One of the biggest reasons we love Kiva Confections Terra Bites, & especially the milk & white chocolate fused with blueberry flavor, is because of their consistent and reliable production quality. Every tin hosts 24 round, less-than-bite-sized balls of explosive flavor, for a total packed-punch of 120mg of THC. But the consistency isn’t just from tin to tin. I’d go so far as to claim that Kiva has nailed down their dosing to the point that each tiny chocolate ball does in fact include 5mg of THC, which provides an excellent reference point for new and seasoned edible-users alike. Kiva uses a blend of indica and sativa strains in their edibles, which creates a hybrid, full-effect high to meet a range of patient needs. As you might imagine, Kiva Terra Bites are perfect for patients who rely on low-dose THC to treat their symptoms and conditions, as each ball only contains 5mg of THC. But the bites still make for a great edible product for other medical and recreational users, as you can eat up to 24 bite-sized pieces from one can! Also, and probably because I’m just a clandestine cannabis consumer myself, I’ve found Terra Bites particularly useful for on-the-go or in-public situations, like working at the office or while traveling to my next destination. The next factor to be considered, of course, is the Kiva’s chocolate taste, as it’s the crucible of what makes a Kiva product, a Kiva. In fact, Kiva globally sources all its chocolate (and espresso beans) from Tanzania, and their dark chocolate is 54% cacao. Now on to the Blueberry flavor itself, and how it’s achieved in the first place. The making of Kiva Terra Bites is rather impressive. The company starts with dried blueberries, generously dusted in cocoa powder, to which a layer of white chocolate is added. Next, they’re again dusted with blueberry (and a dash of raspberry) powder before a final layer of polished milk-chocolate completes the reciple. They’re deceptively simple in appearance, but after trying them for the first time, it’s hard not to notice the attention to detail that goes into each bite. Kiva Terra Bite (Blueberry) Ingredients: Milk Chocolate (Sugar, Cocoa Butter, Milk, Unsweetened Chocolate, Soya Lecithin, Pure Vanilla), Dried Blueberries (Blueberries, Sucrose, Sunflower Oil), White Chocolate (Sugar, Cocoa Butter, Milk, Soya Lecithin, Pure Vanilla), Cannabis Extract, Polish (Water, Gum Arabic, Sucrose, Corn Syrup), Natural Flavors, Freeze Dried Blueberry Powder, Freeze Dried Raspberry Powder, Confectioners Glaze, Cocoa Powder, Citric Acid. Kiva Confections hosted the most impressive booth at the recent Cannabis World Business Expo in LA. Resplendent in richly-colored wood panelling and sporting the ambiance of an exclusive boutique shop, the booth attracted visitors in droves, including yours truly, to sample their world-class cannabis-inflused chocolate products. Kiva Terra Bites have been around since 2013, when the company won the San Francisco Patients Choice Cup in the medical cannabis edibles category. Kiva also recently introduced a new addition to their product line – Kiva Minis, which sports doses of 15 or 45mg of THC. Even though the company globally sources its ingredients, its cannabis indica & sativa strains come straight from California, and that’s where you’ll find most Kiva products being sold. They’re now available in most popular dispensaries. If you’re interested in purchase Kiva Terra Bites from a California cannabis dispensary in your area, visit the Nugg website, where you can place orders for marijuana delivery online in seconds! From their informative packaging and trusted consistency, to the dynamic sweet and tart flavor of their products, Kiva provides top of the line medical cannabis edibles. How much are a tin of Kivz Terra Bites? The whole packaging,and “blueberrys”is a great purchase. So i am delighted to be introduce to these. I will now always carry my Terra Bites in my purse,right along with my Altoid mints….